The Axler 12" Dual Mega Ball Clamp Arm with 1/4"-20 Accessory Mounting features four articulating joints with 1/4"-20 threaded studs and a 5" extension with threaded accessory mounting holes. The center lever on each clamp arm tightens or loosens that clamp. The threaded mounting ends feature a rubber-topped platform with a 1/4"-20 threaded stud. A thumbwheel rotates the studs, enabling you to tighten or loosen accessories. Made from anodized aluminum, the mounting ends feature a ball joint system with an O-ring integrated into the ball. This allows you to tighten the clamp on the ball joints and lock it in place without having to overtighten the clamp. The ends can swing through more than 180° of arc and can be locked and held in place by merely tightening the center knuckle. 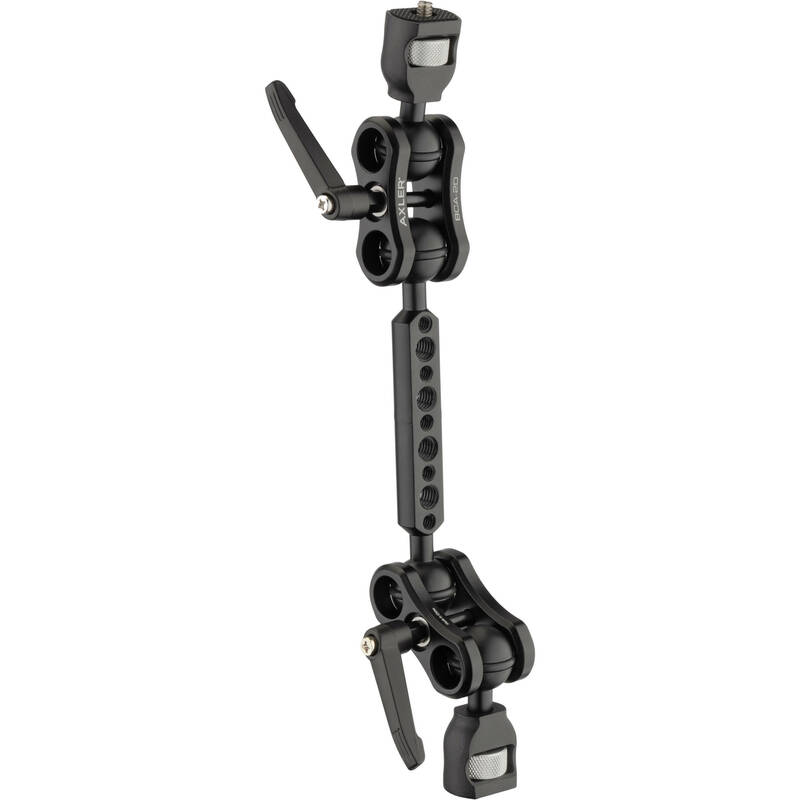 This item is made by using two BCA-2 clamps and mounting a 5" extension bar (AS-5) between them. This creates a longer arm that also has four 1/4"-20 and four 3/8"-16 threaded mounting holes on the center bar for attaching accessories. Made from anodized aluminum, this clamp is flexible and lightweight. The integrated O-ring on the ball ends provides friction to hold the clamp in place, while allowing the ends to move when the clamp is loosened. The O-rings also eliminate the need to overtighten the clamp, thus reducing stress on the clamp and extending the useful life of the clamp. Box Dimensions (LxWxH) 6.5 x 6.5 x 3.0"
12" Dual Mega Ball Clamp Arm with 1/4"-20 Accessory Mounting is rated 5.0 out of 5 by 1.